5 Bedroom Semi Detached House For Sale in Liverpool for Asking Price £525,000. 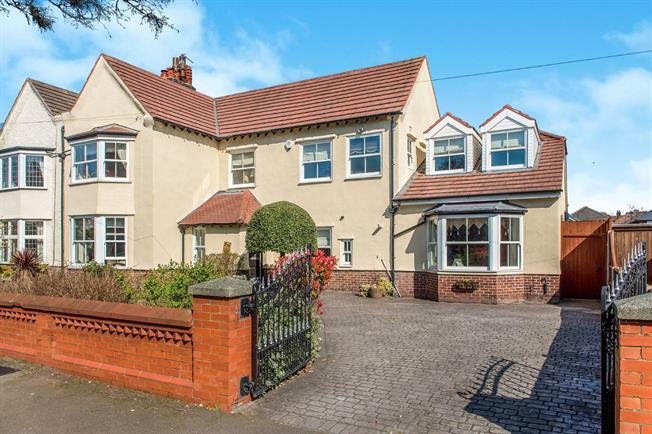 This impressive property, situated in a prestige Crosby location, offers 5 bedrooms and has a spacious annexe building attached. The property has undergone significant extension and modification but retains its charming character features. The accommodation briefly comprises; porch, grand entrance hallway, living room, dining room, family room, conservatory, kitchen, cloakroom, annexe building with one/two bedrooms, first floor gallery landing, master bedroom with en-suite, dressing room and three further bedrooms. This well-planned family home sits within beautiful, well-stocked gardens to front and area with off road parking to front. Double glazed uPVC windows. Tiled flooring. Impressive and grand entrance hallway with turned staircase leading to first floor. Sash window to front aspect. Radiator. Spacious reception room with feature, double glazed, bay, sash windows. Original fireplace with open fire and character surround. Radiator. Karndean flooring. Feature, character fireplace with open fire. Radiator. Bright and airy conservatory with hard wood flooring. Double glazed uPVC windows and French doors to garden. Fitted wall and base units with complementary work surfaces. Integrated double oven, gas hob with extractor hood and dishwasher. Stainless steel sink and drainer with mixer tap. Tiled flooring. Double glazed uPVC windows to garden. Double bedroom with double glazed uPVC French doors to garden. Radiator. Currently used as a lounge. Feature bay with double glazed sash windows. Fireplace and surround with electric fire inset. Radiator. Gallery landing with two double glazed sash windows to front. Panelled bath. Low level wc. Wash basin. Heated towel rail. Double glazed sash window. Tiled walls and flooring. En suite with shower enclosure. Low level wc. Wash basin. Double glazed uPVC window. Tiled flooring. Radiator. Generous walk in wardrobe with plentiful hanging and shelving space. Feature double glazed sash bay windows to front. Radiator. Double glazed uPVC windows to rear and side aspect. Radiator. Four piece suite comprising; shower cubicle, panelled bath, low level wc, wash basin. Double glazed sash window to front. Tiled walls and flooring. To front block-paved driveway providing off road parking for two cars, laid lawn and borders. To rear well-stocked and established rear garden, mostly laid to lawn with patio seating area and raised timber decked seating area with sunny aspect.